Earlier this week, SoftBank CEO Masayoshi Son, who is also Japan’s richest man, told a group of investors how he thinks his company is undervalued compared to the asset value of its investment portfolio. 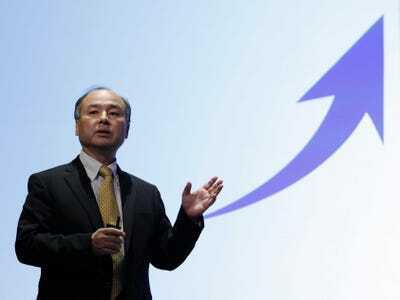 “SoftBank is currently valued less than the sum of its golden eggs,” he said, according to Bloomberg Businessweek. The Bloomberg article points out how SoftBank’s market value stands at around $US82 billion, while the net value of its public shareholdings exceeds $US114 billion. SoftBank has investments in over 1,300 companies, including tech giants like Alibaba, Sprint, and Yahoo Japan, as well as websites like BuzzFeed and Cheezburger Network. “There is such a thing as a Buffett premium, because the world sees him as an investment god. … There will come a day when the market will give a premium to SoftBank,” Son told the investors, according to the report. By “Buffet premium,” Son is obviously referring to Warren Buffet, and how investors tend to give more value to Buffet’s Berkshire Hathaway stocks, and often other companies he invests in, too. In fact, Berkshire Hathaway trades at 21.5 times estimated earnings, compared to SoftBank’s 14.2 price-to-earnings ratio, according to the report. A high ratio typically implies a premium on the company’s stock price or higher expectations for its management. Perhaps in an attempt to make a case for this argument, SoftBank added a couple slides in its earnings report this week to show its strong investment record. 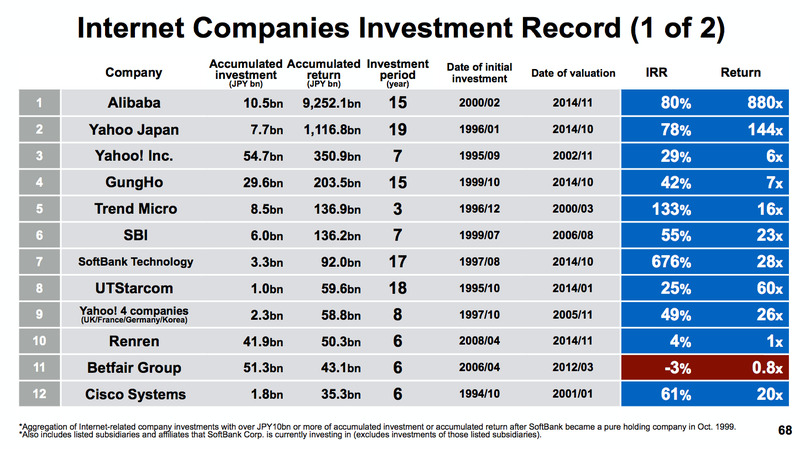 It first shows a list of the biggest internet companies it’s invested in over the past decade or so. 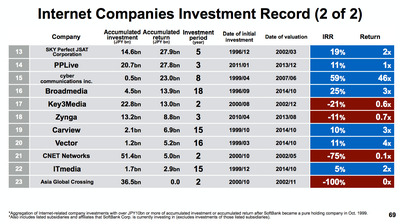 It’s worth noting how most of its biggest returns came from investments lasting over 15 years. 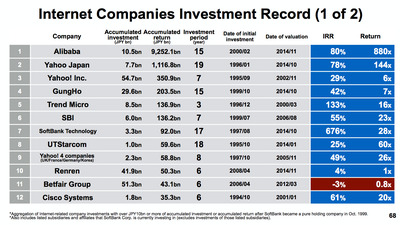 And then it goes on to show how much return these investments generated on average. 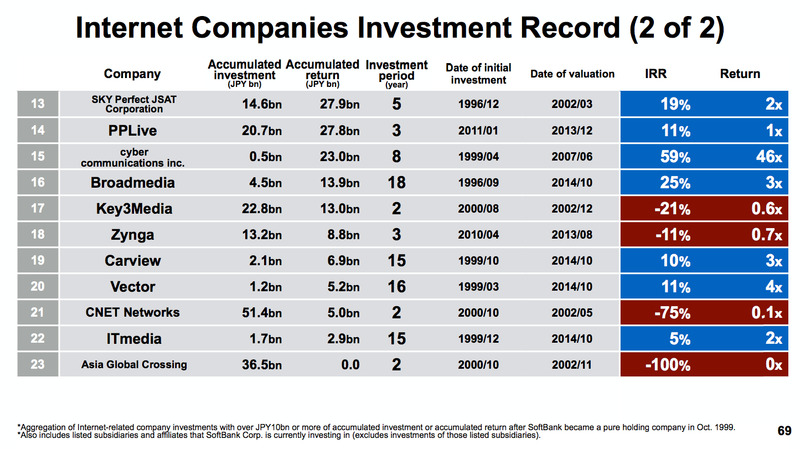 With an IRR of 45%, SoftBank has done better than some of the top-performing US fund managers and VC firms. 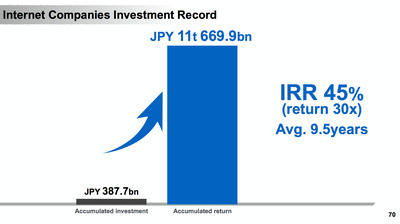 An IRR is a common metric used to measure the profitability of investments.